Tigs has a home! 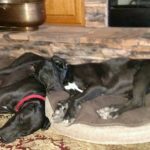 - Rocky Mountain Great Dane Rescue, Inc.
Tigs has a home with Beckie, Mark, and their 3 teenage children! Beckie grew up with Danes, and this will be the family’s 4th Great Dane together. In May, they adopted a Great Dane puppy named Kingsley who is also black, and is almost the same age as Tigs. They could be brothers! In fact, when Kingsley and Tigs met, the family knew it was a perfect match by how well they got a long, and played together. Tigs (red collar) and Kingsley will have 15 acres of fenced yard to run and play on, and being both puppies, they will need it! Beckie works from home, and can devote as much time as necessary for training, and Dane snuggles! This family is very loving and devoted to their dogs, and will go above and beyond for them. We couldn’t be happier for Tigs! Way to go sweet pup! Enjoy your new life!